Handcrafted on a US barrier island with 14k gold-filled double layer chain and one-of-a-kind agate druzy geode. Each geode sparkles with one-of-a-kind crystals. No two necklaces will ever be the same. 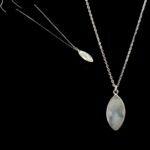 Measures 14″L at longest chain w/ 2″L extender chain with lobster claw clasp. 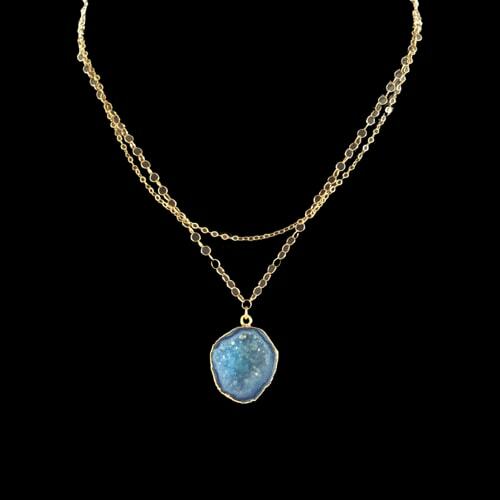 The Camilo necklace comes with an agate druzy geode and has its chains laced in 14k gold. They come in different designs for each one purchased. That is to say that you can never find any other Camilo necklace that has the same design as yours. That is great, knowing that you won’t have to worry about other people getting their hands on a particular design that you love. The druzy comes in three different colors. You have the options of either choosing the grey color, blue or brown color, whichever is your favorite. 14k gold: comes in a sparkly 14k gold. Something to redefine your fashion awareness, leave you shinning in the crowd and display your class difference. Agate druzy geode: shiny as they come. The agate druzy geode present in the camilo necklace makes all the difference. They are beautiful to look at and just packs a whole lot of shine. Different colors for the druzy: you are free to choose from three different colors of druzy available. The colors available for your pick are blue, grey and brown. You can always reach out for your favorite or whatever you think will work best for you or your outfit. 14 inches long: the length is just enough for you. It features a 14 inches long gold chain coupled to a 2 inches long extender chain designed to hold onto the druzy. Strong and durable: they are built to last. With the 14k gold chain, you are guaranteed to use the Camilo necklace for as long as you want to without any fear of wears or breaking apart. They are that strong and guaranteed to last for as long as you need them. Good gift items: they are perfect for showing your loved ones that you care. The Camilo necklace will serve whatever purpose you intend them to serve.